“Mom, remember the day we went to the Science Center and saw that BRAIN? And I drew the brain?” James had drawn a pretty close replica of the brain he saw while there and even color coded the different areas. It was not at all what the planned activity was for that day, but the volunteer just went with it, and they talked about the areas of the brain as James was drawing them. I do remember that day at the Science Center and the care shown to James by this former Montessorian (now in his late 40’s or early 50’s). I’m pretty sure that James now thinks that he is destined to work at the Science Center. 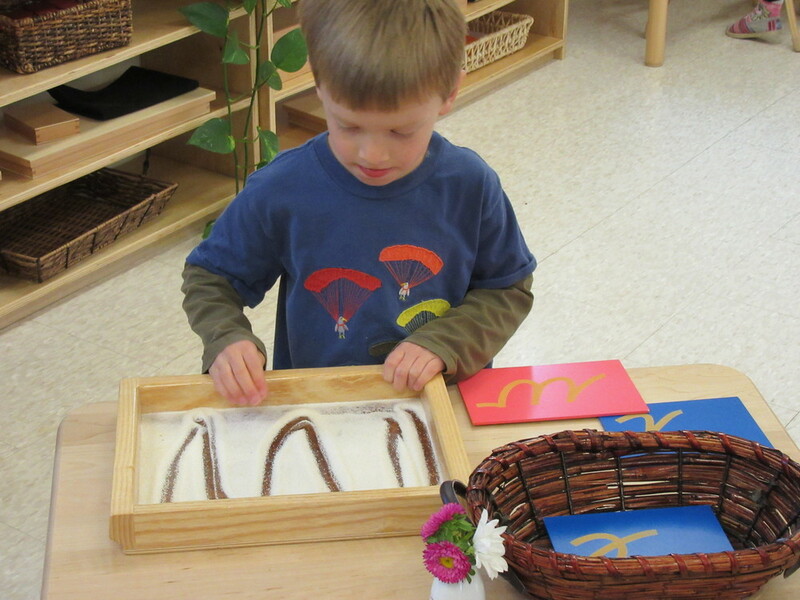 It was a sweet Montessori moment, and I’m glad it made an impression on James, too. If the stars align and the universe leans in your favor, what THREE things can kick your morning off on the right foot each and every time? 3. Hugs from my girls! 3. I have to leave my house by 7:43 or else I feel late and rushed. *Christina, We think you need to divulge what makes your smoothies and coffee “special.” You have piqued our interest! I have spent this year in survival mode (new baby! ), but maybe I’ll have early morning yoga and meditation on my list someday. 3. Some 15-20 minutes of a good read: insightful, humorous, academic- you name it! 1. My cats wake me up by licking my hair and kneading me (they have a biological alarm clock). 2. I spend appropriate amount of time in the bathroom, showering and primping. 3. I eat breakfast, which is almost always delicious, with my best husband. 3. Leave the house at 6:30 AM to be at work by 7:00 AM. (It’s a mind thing). 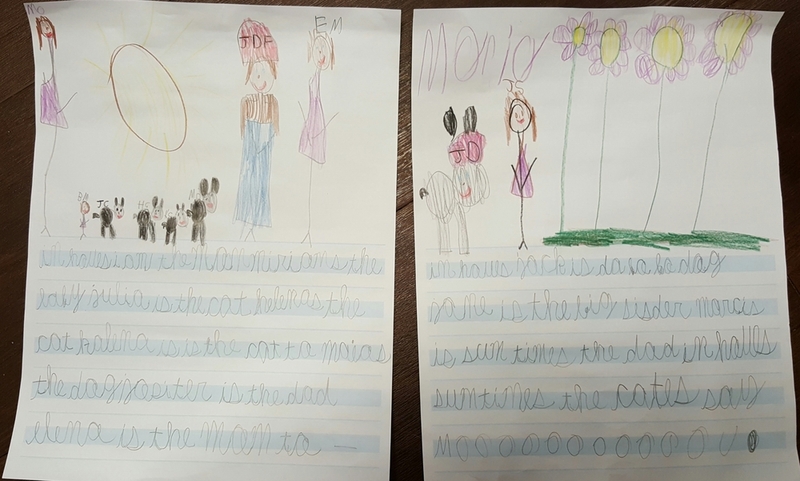 Our beloved Lower Elementary Assistant, Sophie Andre, shared two of her Montessori Moments from personal experiences at home with her daughter, Lynne, who will be joining one of our Villa di Maria Primary classrooms this fall! Also important to note is that Sophie is French, so her blog posts are written en francais and then translated into English immediately following each. 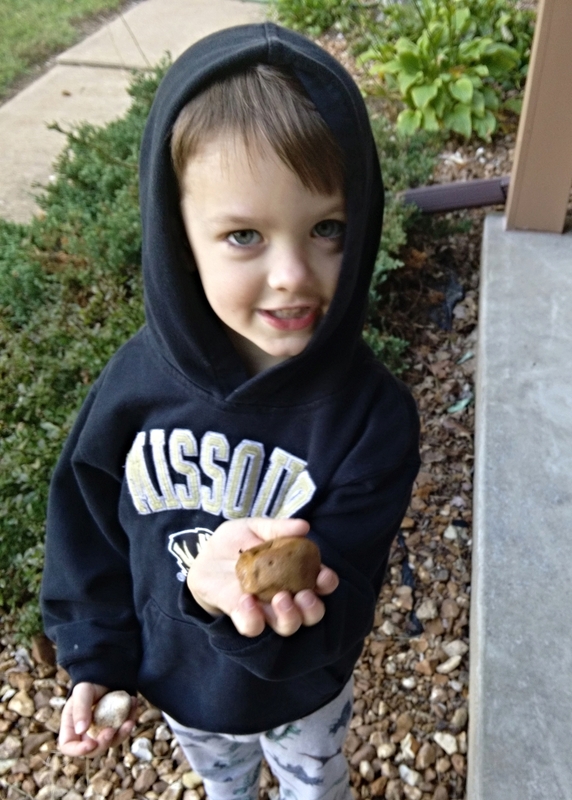 Special Montessori nuggets with a pre-primary child you won’t want to miss! 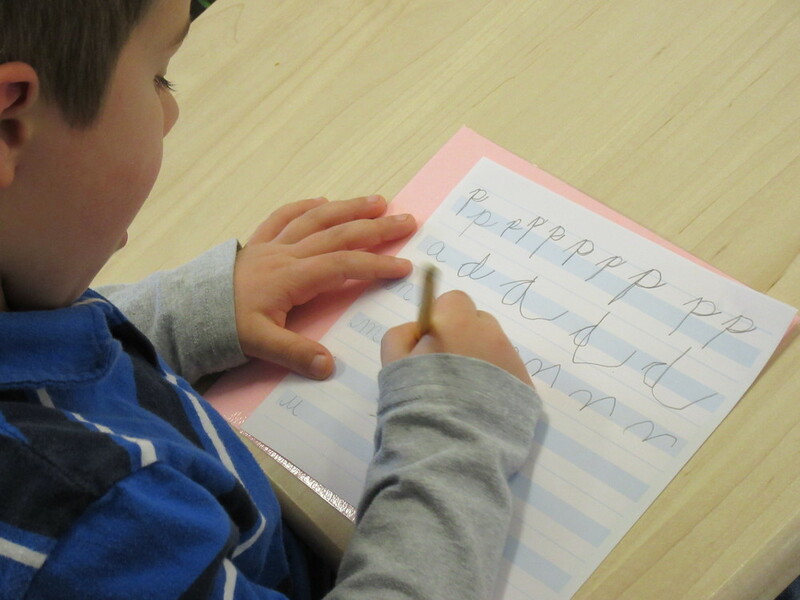 Writing in the Montessori classroom. 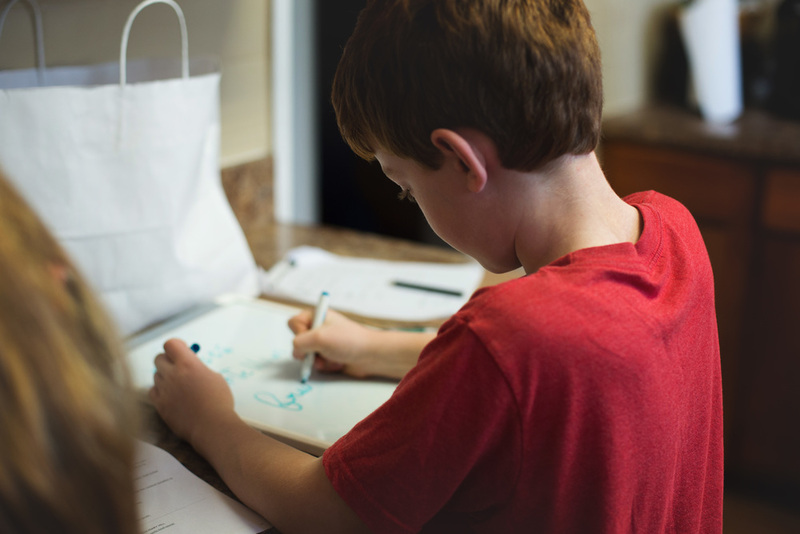 Our favorite Dr. Maria Montessori described writing as a complex task involving both physical and mental capabilities: lightness of touch, the ability to adapt the hand to an amount of space given, coordination of movement, isolation of sound, visualization and recognition of symbols. 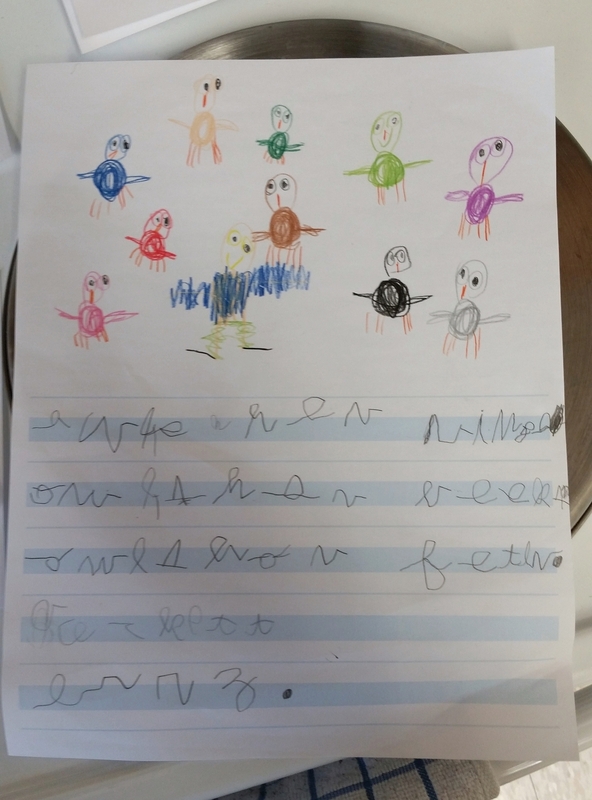 In addition, she emphasized that children must develop self confidence AND the desire to write- the desire to combine sounds with symbols to form words. Children being exposed to an abundance of vocabulary in every corner of the environment. 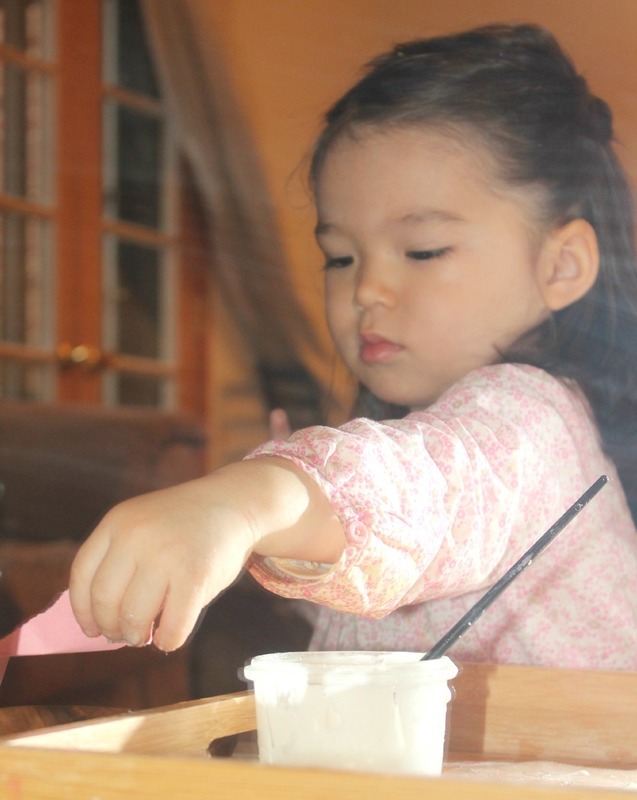 Children develop finger strength, lightness of touch and control through lessons including: cylinder blocks (knobs), touch boards, touch tablets, sandpaper globe and pouring. 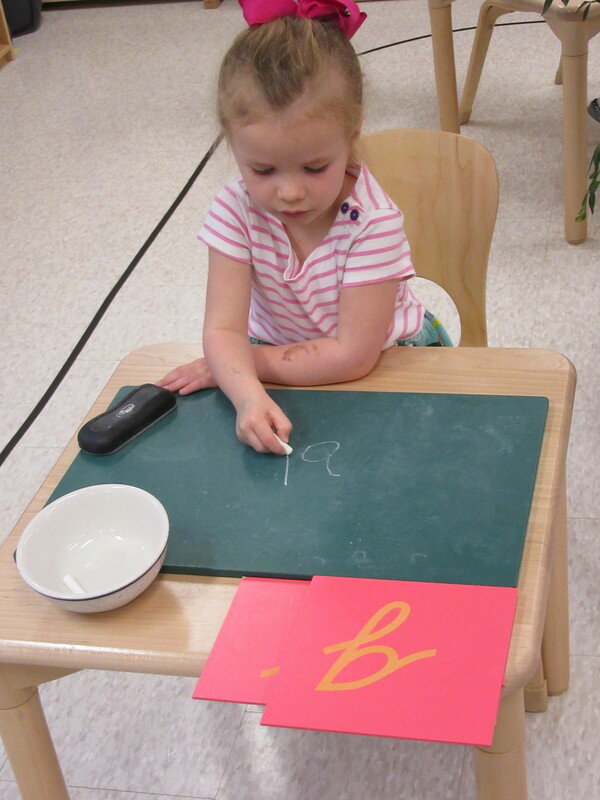 Sandpaper letters- Not only tactile, but kinesthetic, visual and auditory as well. The child learns each sound and the shape that each “sound” makes by tracing lightly and repeating to mastery. Hand-eye coordination develops in the process. 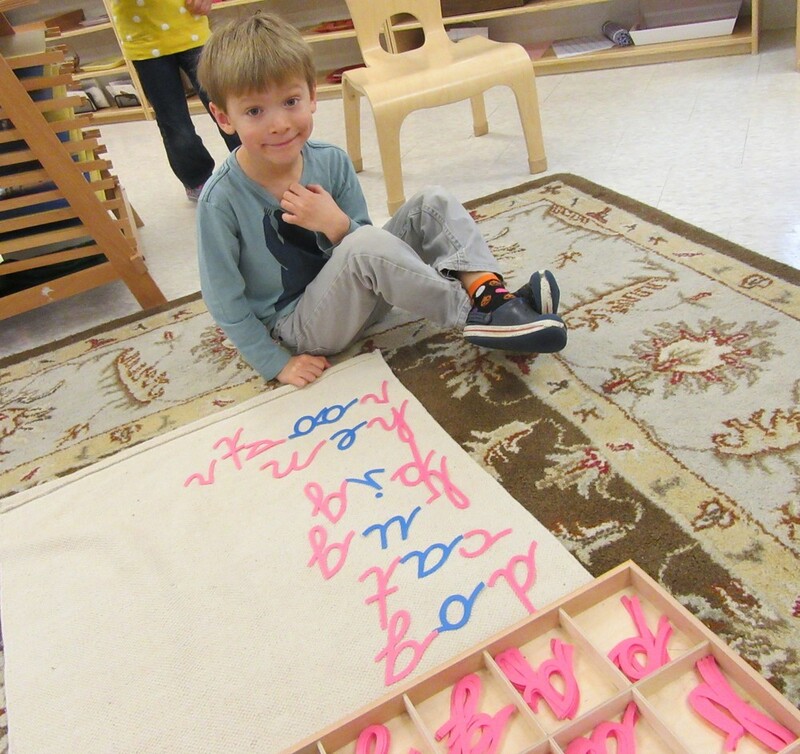 Movable alphabet- This lesson essentially allows for word formation without frustration. 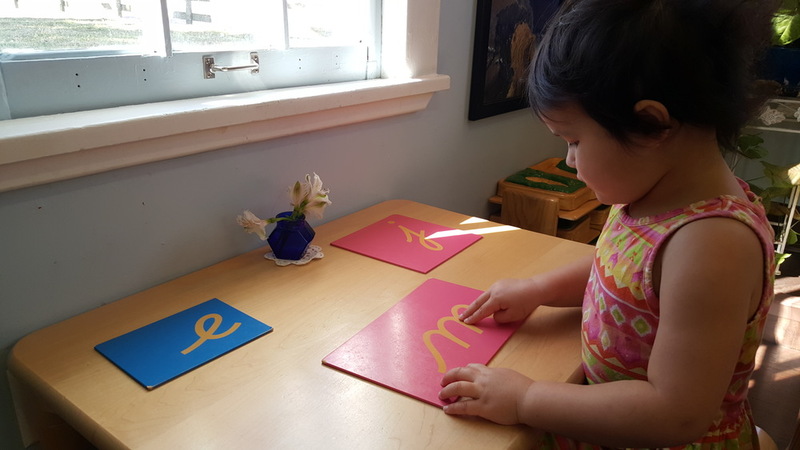 The child uses the sound-symbol relationships to build words with small sandpaper letters and then strings them together into phrases and sentences. They vowels are blue; the consonants are pink. 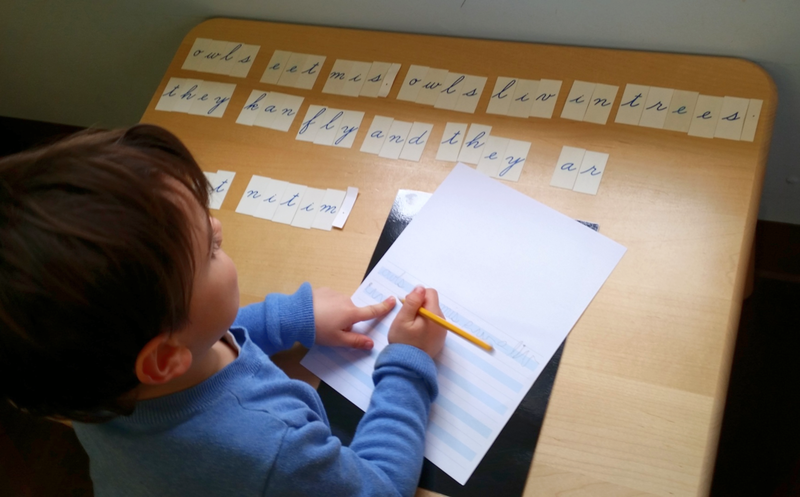 They’re connecting letters phonetically to make words before having to write them correctly using pencil and paper. Another step in building success and the desire to write! Metal insets- These geometric shapes are used concurrently to trace and develop lightness of touch and create different types of lines for letter formation on paper. 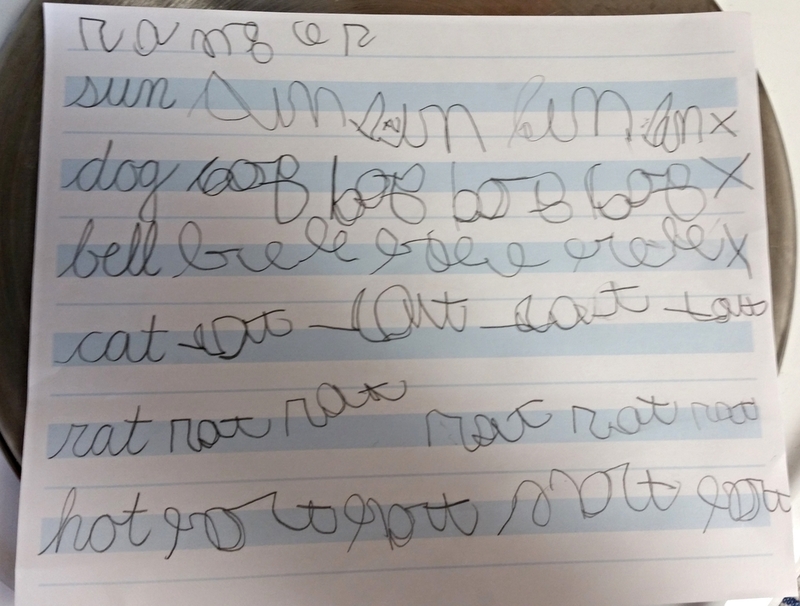 Cursive writing on paper- Here’s where the EXPLOSION begins! Stories! Thoughts! Observations! Poems! Jokes! Lists! 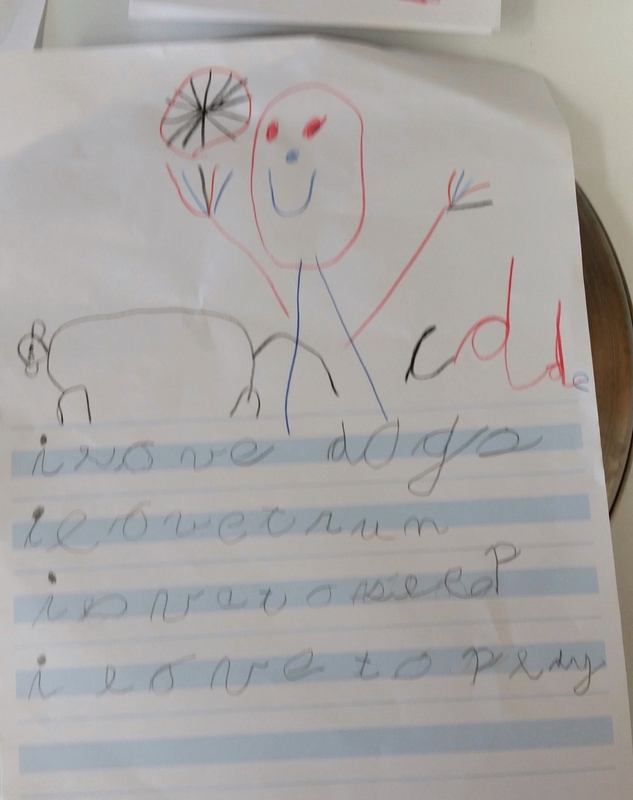 They all come spilling out of the child’s mind through the hand onto the paper. And, then. The EXPLOSION into reading… to be saved for another day! The GLORIOUS MOVABLE ALPHABET! Color-coded vowels and consonants. That Maria Montessori… big brains. The stories and illustrations start flowing and flowing and flowing! 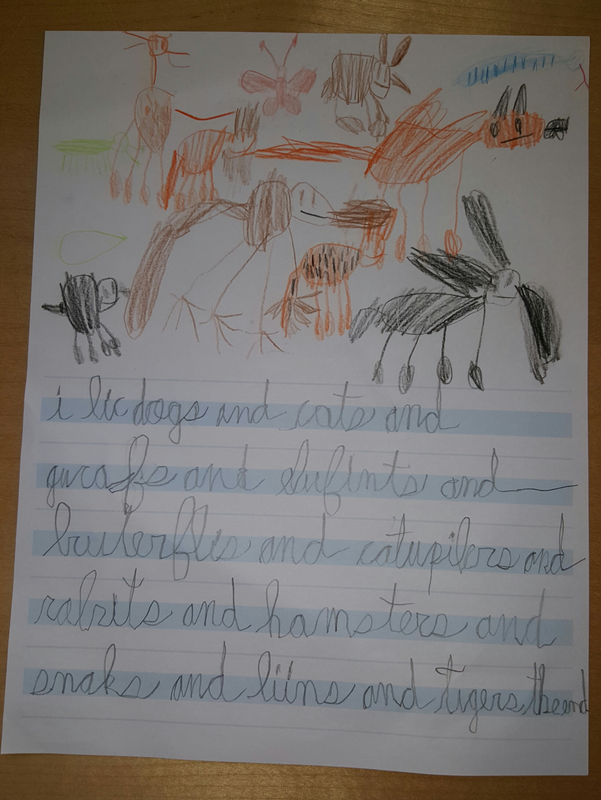 We’ve got one heck of an animal lover here! The stories lengthen. The personalities expressed! 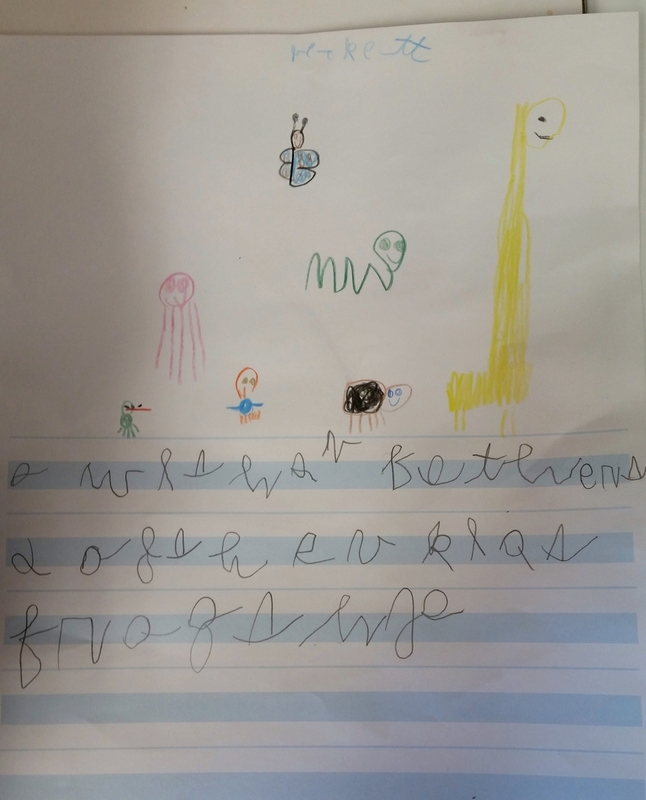 Several more writing progression examples from our Children’s Houses! To be savored! 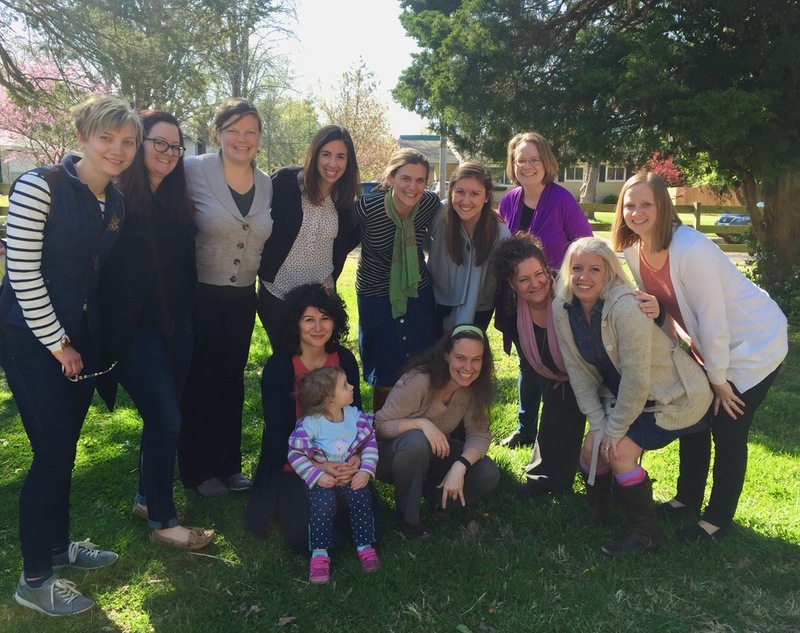 The Elementary Hot Lunch has historically been a highly coveted experience at Villa di Maria Montessori School. A long-held tradition. Practical life at its finest. The chefs deem it one memorable week when it’s THEIR turn to plan, prep and execute Friday’s meal for the first through sixth year students. 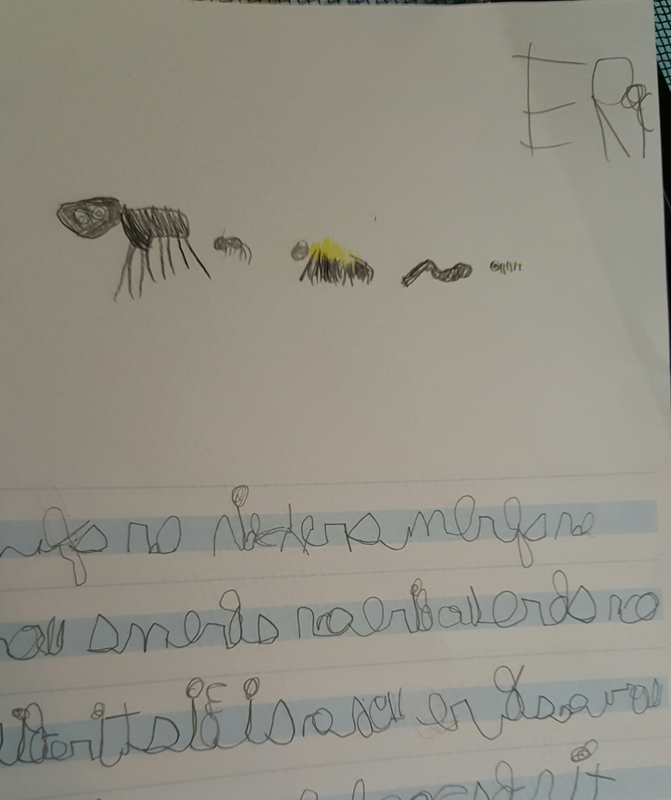 Second, we shall share the inside scoop from several Elementary students, who kindly volunteered to answer some questions via a written interview. First, the three cooks for the week meet to discuss menu options and finalize a main dish, a side dish and a dessert. Kitchen supplies and ingredients are checked. The week’s menu is displayed on the whiteboard and hung in the kitchen, enticing all who pass by! To the grocery store they go! 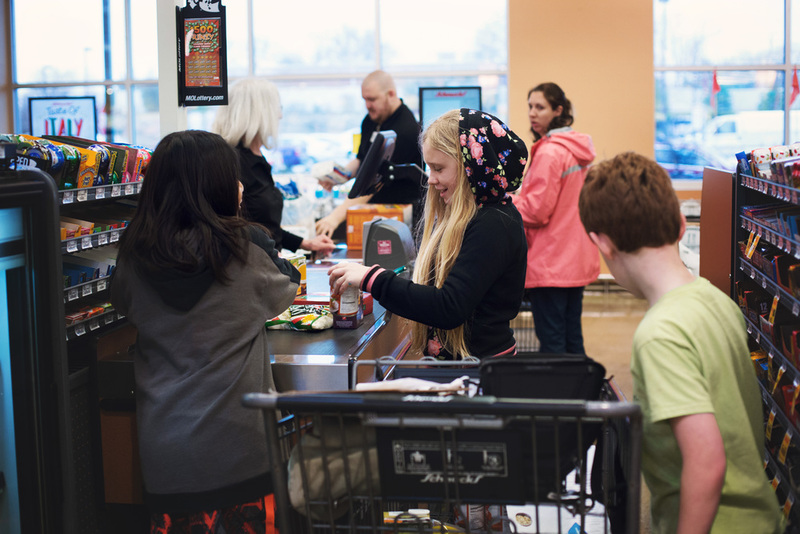 One of the classroom assistants accompanies the cooking crew, but the students manage the shopping, calculate amounts of each item needed and keep track of costs as they make their way through the store. 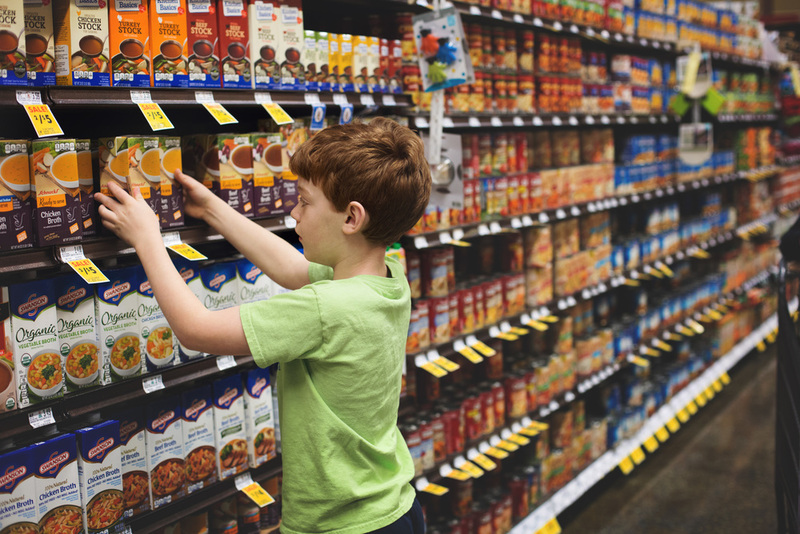 Choosing the healthiest options to add to the cart! Friday morning! The chefs divide tasks and dig in. The feast is about to be served! 1. When it’s your turn to cook hot lunch for the week, how does the entire group decide upon a menu? Marguerite: We all decide on something and vote on it. Ella: We all think about what kind of meal by ourselves, and then we have a vote on which one sounds best. Emily: We throw random ideas together and vote on our favorites. GAC: The three students all bring up suggestions of food they’d like to eat and vote upon them. It can be frustrating because everyone has different tastes. Ella: We have a certain amount of money to spend to get the stuff you need, so you have to find the best deal, round up your answer and subtract every time. What store do you typically go to? Do you go to more than one place? Ella: We only go to one place- Schnucks. How do you know how much of each item to purchase? Klaus: We look at the recipe. Marguerite: We measure the pounds, and we see how many people and how much we need. Ella: You have to know how many people are eating hot lunch and then see how much food is in the box. 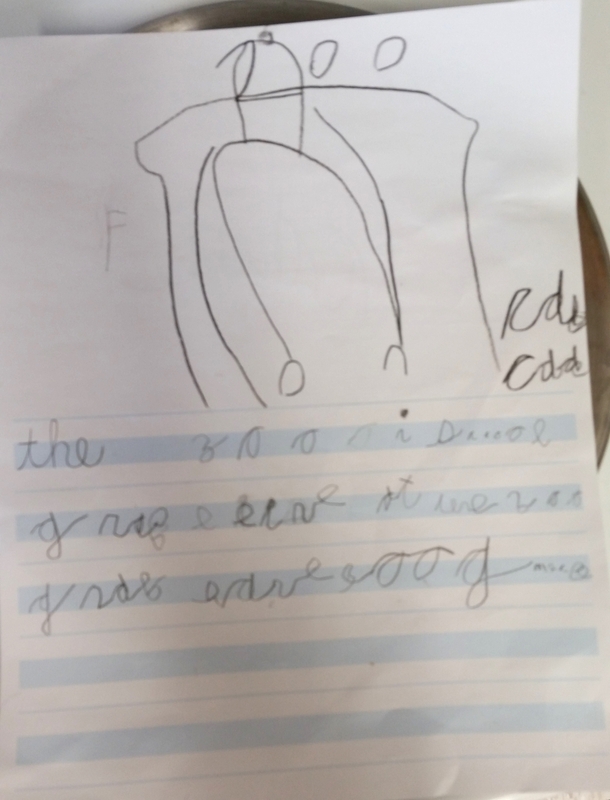 GAC: We usually figure out the number of servings we have before we go to the store, and we write down how much we need. 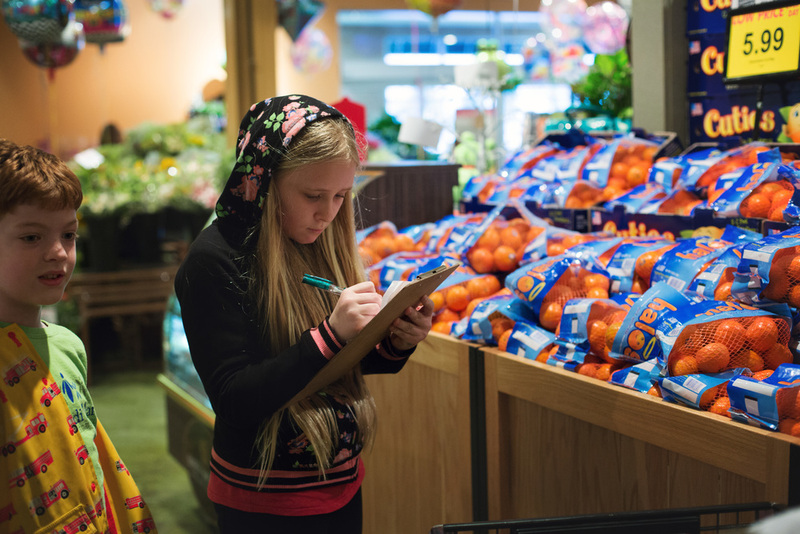 Do you have any grocery store tips to share? Ella: If you don’t feel you’re great at math, I would practice it. GAC: When doing math, do it fast so you can go look at the desserts. Also, try to get things that are on sale, so there is money left to buy candy! 3. 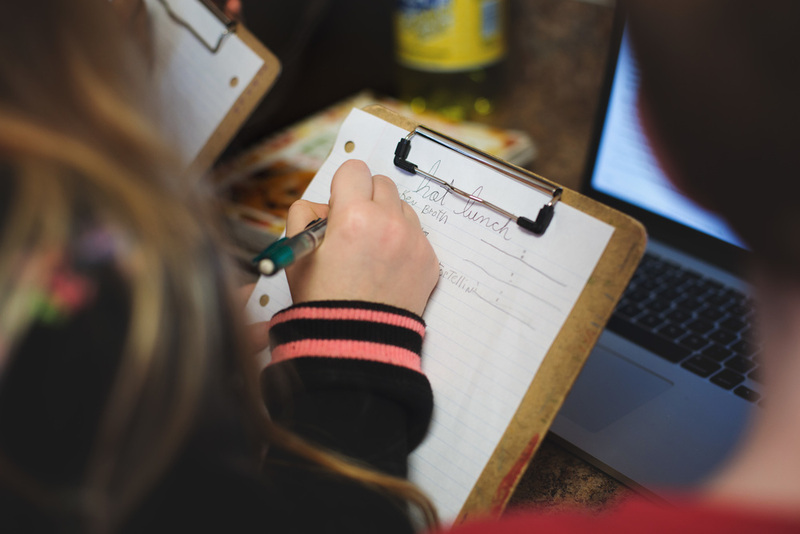 Do all the students help make each part of hot lunch or do you divide tasks? How do you decide? Ella: The three people who are cooking hot lunch split up and choose what they want to cook and serve. 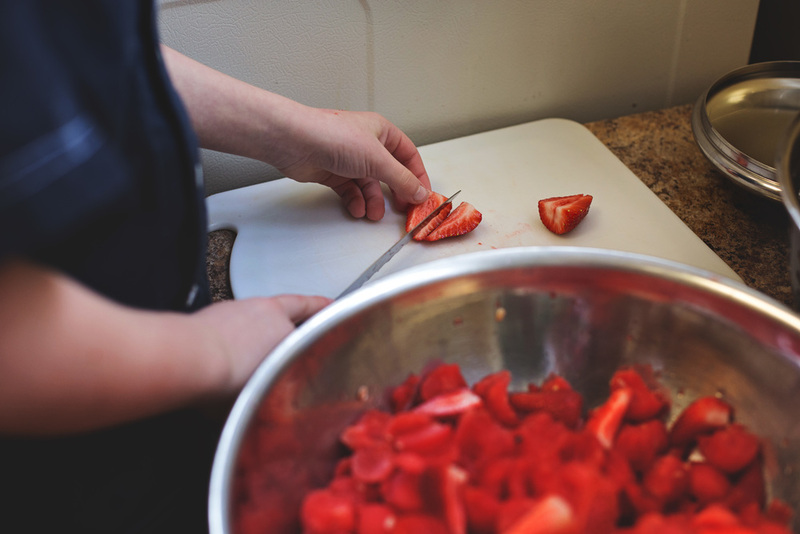 Emily: We all pitch in, but I prefer to cut the fruits and veggies. 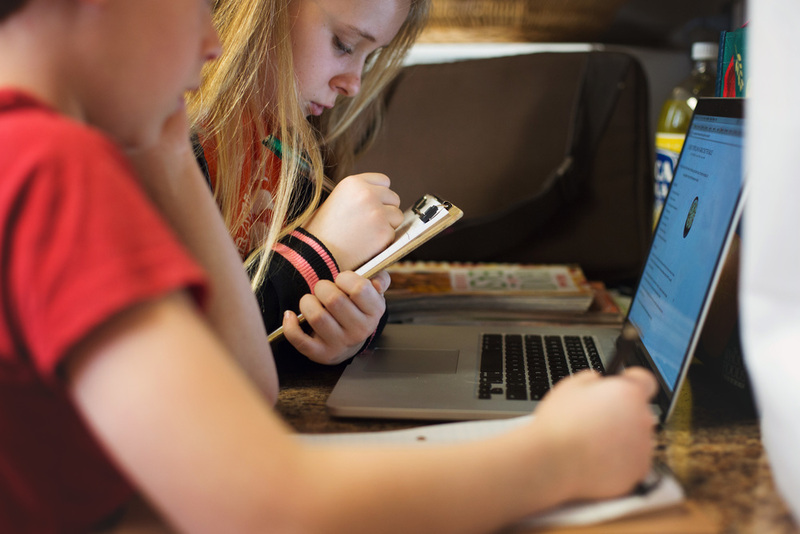 GAC: The students are put on different tasks by the adult, and when the students finish their task they can help others with theirs. 4. What has been your favorite hot lunch to EAT so far? Ella: My favorite hot lunch is the one where we have brunch- breakfast for lunch! Cecilia: Calzones- they were super delicious! Ava: Fettuccine Alfredo- it was tasty! 5. What has been your favorite dish to MAKE so far? 6. What are all the tasks involved in cleaning up once everyone has enjoyed hot lunch? Marguerite: Washing the dishes, cleaning up the table from hot lunch and saving the leftovers. Ella: Washing the dishes, drying them, putting them away. We also sweep the floor and wash the countertops. GAC: First we all take the leftover food to the kitchen and the rest of the items on the table. Then we wash all the dishes and dry them and put them away. Last, we sweep the floors and wipe the counters. 7. If you could design your very own hot lunch, what would you make for the entire elementary? 8. What has been the funniest thing that has happened either in planning, shopping, cooking, serving or cleaning up? Marguerite: We didn’t have enough money! 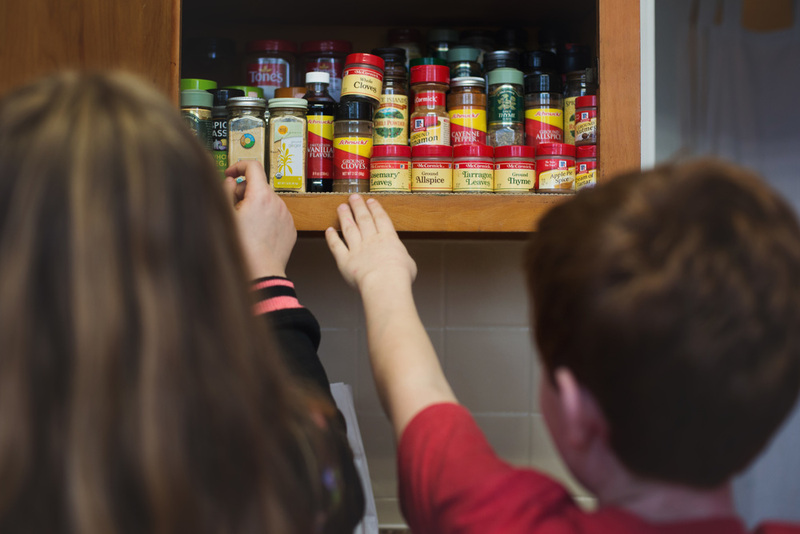 Ella: To me, the funniest part of hot lunch is cooking because I love cooking with my friends. Emily: Well, when I was cooking the pancakes, I flipped one too high, and it fell on my head. Ha! GAC: Ava dropped cheese on the floor, and Mrs. LeBeau got upset, but it was just a little cheese! Cecilia’s group once added their shopping answers (the grocery list bill) in a tent full of beer. Once Mrs. LeBeau handed Gabby a tray of vegetables to put on the table to serve, and Gabby just started dumping the vegetables into the compost pile. 9. Are you the master of making anything special at home? If so, what is your specialty? Ella: I’m not great at cooking, but I am fairly good at making desserts. Emily: Omelets and fruit compote- In fact, I can do it myself without an adult. 10. When the new elementary building is built, what do you think the new kitchen should have that it currently doesn’t have? Ella: I’ve learned to make better deals at the grocery store. Like if you want to get parmesan cheese and one small packet is not enough, you would get the big one instead of two small packets because it is less expensive. GAC: Keep your hands clean. 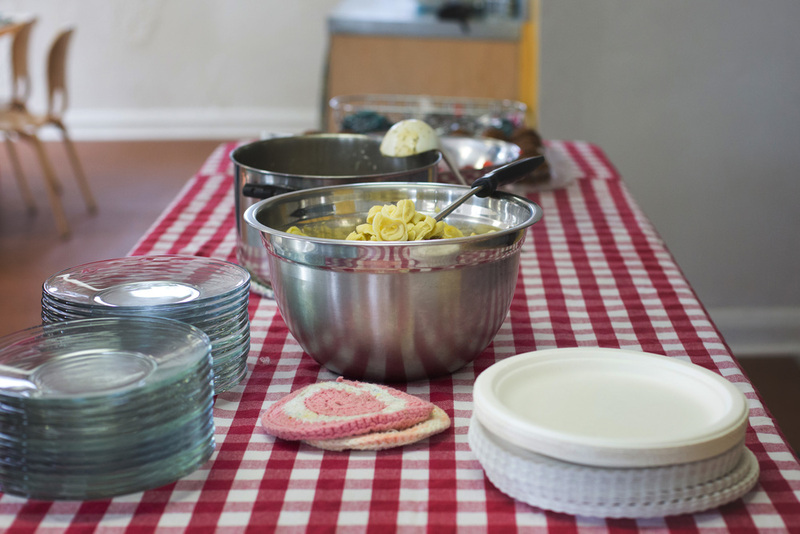 Do the dishes first so that you don’t have to do them at recess. Ella: My mom and dad because they aren’t picky, so they won’t offend my food. Emily: My family and neighbors because they’re awesome!